The minimalism of coat by JULIA POMOSHKO allows to refuse from unnecessary things and concentrating on the inner inspiration. Natural materials, laconic cut, strict lines and the simplicity of form characterize the silhouette of clothes by JULIA POMOSHKO. 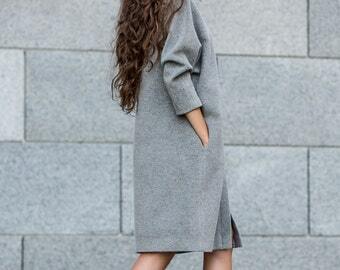 The coat will give you a unique softness, warmth and comfort. Long waistcoat with faux fur inserts. Pockets are in the seams. Lining can be warmed if necessary. You can wear it at a temperature from 0° to +15°. ► Composition: exterior - 100% wool, lining - 90% viscose, 10% elastane. The model is wearing 38 size. Height of the model is 170cm.